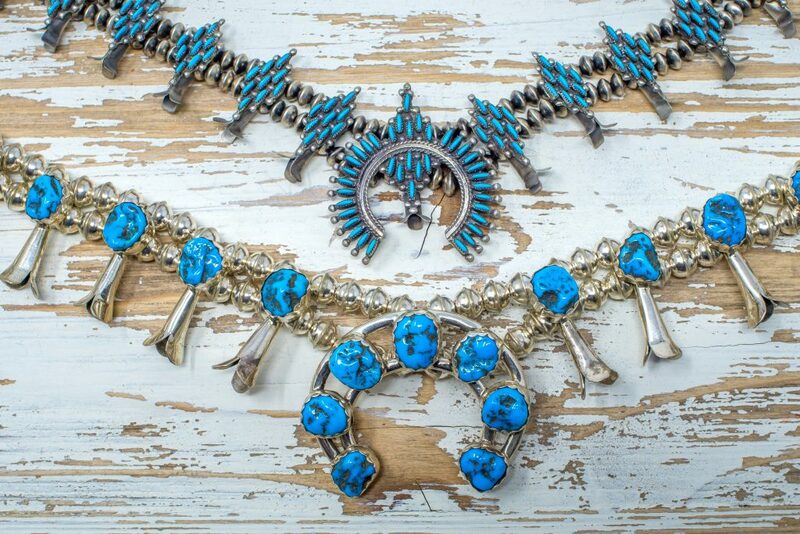 If you’re new to the world of collecting Native American jewelry, or visiting the Southwestern United States for the first time, you may have heard the term, ‘Squash Blossom’. 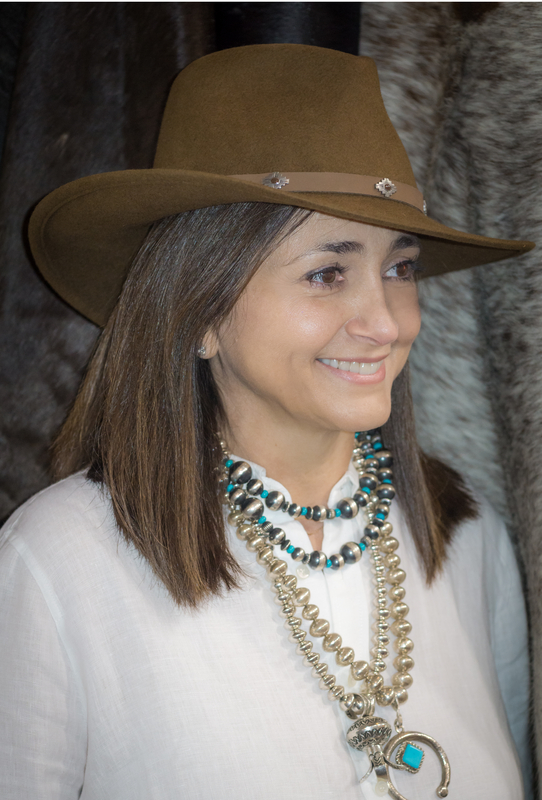 If you’re familiar with Navajo jewelry, you already know a Squash Blossom necklace can be a spectacular piece and a prized possession. Perhaps you’ve wondered why a necklace which features vegetable foliage is considered valuable, coveted by people from all walks of life. The history of Squash Blossom necklaces dates back hundreds of years and, as with most historically significant events, involves many different cultures. Let’s dig a little deeper into the subject; background knowledge is as important as working with a trusted jeweler when and if deciding to purchase. Let’s start with the basic design of the Squash Blossom necklace. The blossom itself is usually a tri-petal bead made of silver. There are usually six blossoms on each side of the necklace, with an inverted crescent pendant, called a Naja, hanging in the center. Originally, they were made of only silver, but through the years designers started adding turquoise inlays to the necklaces. These necklaces can be fantastically heavy with all of the materials used, but lighter ones do exist and can be worn on a daily basis. It’s believed the Navajo started making these in the 1880s; the Zuni and Hopi learned from them and put their own individual spin on the design. In the 1970s, the Navajo started to create large quantities of these necklaces to meet the high demand of tourists visiting the Southwest. They quickly became one of the most recognizable icons of the Navajo Nation and Southwestern United States in general. Today, you can find Squash Blossom necklaces made only of silver, inlaid with various types of turquoise, or crafted with coral, jet, spiny oyster, and mother of pearl. A vintage necklace can be worth thousands of dollars; a contemporary piece can be just as pricey depending on designer craftsmanship, the amount and quality of silver, and the various stones used in the piece. But wait– why is it called a Squash Blossom? It is true that the Navajo cultivated squash; it was and is an important crop to them, but the origin of the phrase is unclear. If you look up a picture of an actual squash blossom, you’ll find almost no resemblance to the necklace. 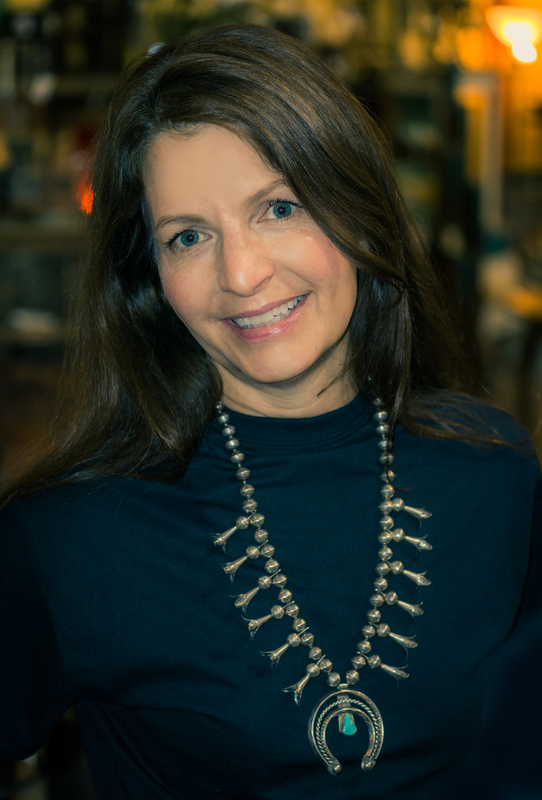 The Navajo word for the necklace has nothing to do with squash; the word for the tri-petal silver bead actually means, ‘bead that spreads out’. While we’re starting to get a clearer picture, why was this term chosen? As with most historical encounters, there was a mistranslation somewhere between a trader and Navajo merchant, and the necklaces became known as Squash Blossoms. Many actually believe that the tri-petal bead more resembles the end of a pomegranate, a design element utilized in the clothing and horse bridles of Spanish explorers. This would explain why the design did not appear in Navajo jewelry until the Spanish arrived in the area, since pomegranates are not native to the Americas. Navajo silversmithing took off when Mexican silver was brought up North. Before this, the Navajo created jewelry from German silver they collected from various traders traveling from the Eastern United States. This ‘silver’ was an alloy which actually contained no silver; instead, it’s a white alloy comprised of nickel, zinc, and copper. 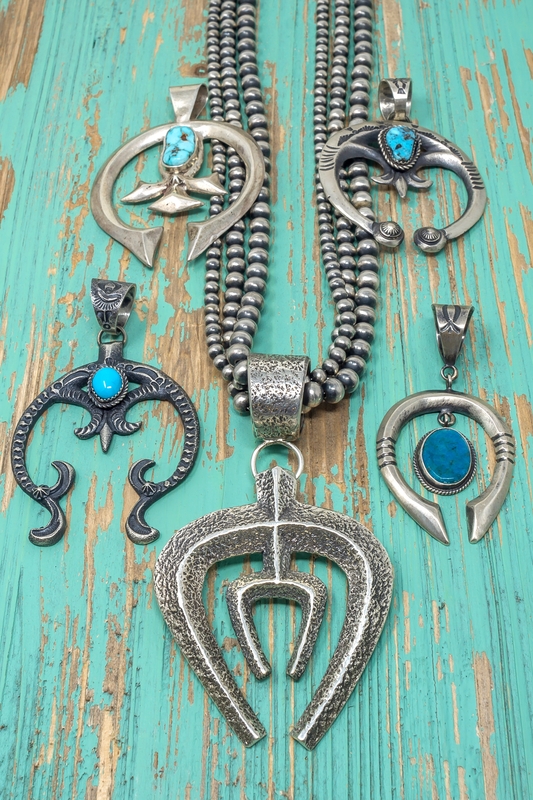 No matter how the materials or designs came about, the Navajo silversmiths made and continue to make gorgeous pieces of wearable art. Selection of assorted Naja pendants; center Naja with over-sized bale shown on a strand of Navajo ‘pearls’. Let’s turn our attention to the focal point of most Squash Blossom necklaces; the inverted crescent shape known as a Naja in Navajo. The history of the Naja is also full of cultural encounters dating back hundreds of years. The Naja had actually been used by the Navajo long before its addition to the necklaces; it was displayed in ceremonies and adorned the headstalls of their horses. While it has no precise spiritual significance, it is held in high esteem to the Navajo, Zuni, and Hopi peoples. The symbol can be linked back to various cultures and societies, including the Moors who invaded and occupied Spain for a length of time. It is believed that the symbol was introduced to the Navajo in the late 16th century either directly from Spanish Conquistadors or by various Plains tribes who had seen it on Spanish explorers. The Moorish invasion of Spain happened over a thousand years ago; a symbol they introduced to the Spanish, which was then introduced to the Navajo, is still promoted and admired as desirable jewelry in 2018! As is the case with most cultures, nothing can exist in isolation: eventually ideas and symbols spread, influencing people worldwide. Next time you see a Squash Blossom necklace either online, at the Heard Museum in Phoenix, or perhaps at a jewelry market in the Navajo Nation, remember all you’ve learned about the necklace. Actually owning and wearing one creates a special, personal statement which is absent in more pedestrian items. The Pickle Barrel Trading Post frequently has Squash Blossom and Naja items in stock, both online and in-store. You’ll find necklaces of sterling silver with brilliant turquoise and other semi-precious stone inlays, plus earrings and pendants which feature individual Squash Blossoms and Najas. Inventory ranges from the traditional to contemporary; when you see these iconic Navajo, Zuni, or Hopi works of art, remember that the history is anything but simple, and the breathtaking craftsmanship and design are built on centuries of tradition.